Out of all the weird and wonderful forms that maniraptors have taken, it will probably surprise no one to hear that it is the alvarezsaurids that fascinate me the most. The most noticeable anatomical curiosities of these theropods are their forelimbs: the arms of alvarezsaurids were very short and their hands were composed almost entirely of an enlarged thumb, with the second and third fingers highly reduced or (in at least one species) lost. Their limited reach, stiffened elbow and wrist joints, and possession of only a single functional finger would have made alvarezsaurid forelimbs little good for grasping. However, despite their small size, those arms almost certainly had a practical use. The humerus (upper arm bone) had a very large deltopectoral crest and the ulna (the larger bone in the lower arm) had a large olecranon process (the point projecting towards the elbow). These features, combined with the well-developed sternum (breastbone), are generally found in animals that need to make powerful forelimb motions, more specifically pulling the forelimbs towards the body and straightening the elbow joint. In the case of alvarezsaurids, such specializations most commonly interpreted as adaptations for breaking into insect nests or wood. 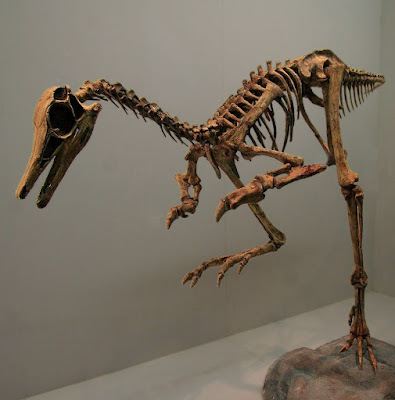 Reconstructed skeleton of the alvarezsaurid Patagonykus, photographed by "Kabacchi", under CC BY 2.0. Note that the vestigial second and third fingers are not included in this mount. In 2010, the description of Haplocheirus from the Late Jurassic Shishugou Formation of China (older than any alvarezsaurid) lent support to the non-avialan status of alvarezsaurs. 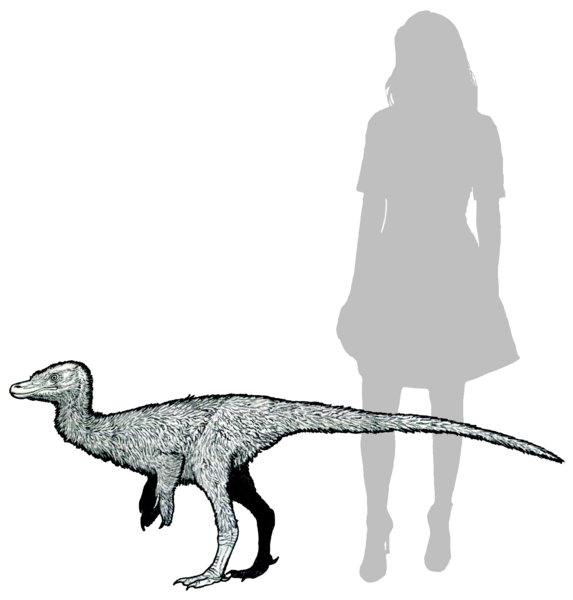 Considered a non-alvarezsaurid alvarezsaur, Haplocheirus looked much like a "standard", non-paravian coelurosaurian theropod; it was an "alvarezsaur that looked normal". However, it shared with alvarezsaurids a slightly enlarged thumb relative to the other fingers, as well as details of the skull and hindlimbs. 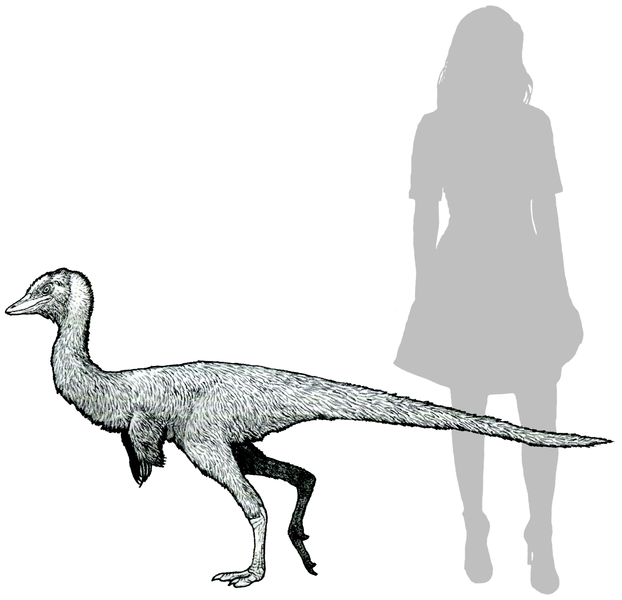 Subsequent studies have largely supported its alvarezsaurian affinities (though at least one analysis found it to be an early ornithomimiosaur instead). Haplocheirus shed a good amount of light on alvarezsaurid origins, but there remained a noticeable gap in the picture. All known alvarezsaurids with their specialized forelimb morphology lived during the Late Cretaceous, whereas Haplocheirus with its incipient forelimb specializations lived in the Late Jurassic, leaving the Early Cretaceous history of alvarezsaurs unknown... until now. In a recently-published paper, Xu Xing and colleagues describe two new alvarezsaur species recovered from Early Cretaceous deposits in China. First of all, it's about damn time. The last newly-named dinosaur to be described as an alvarezsaur was Alnashetri, which was published back in 2012. But more than simply increasing our knowledge of alvarezsaur diversity, the new species described by Xu et al. are significant in what they reveal about alvarezsaur evolutionary history. 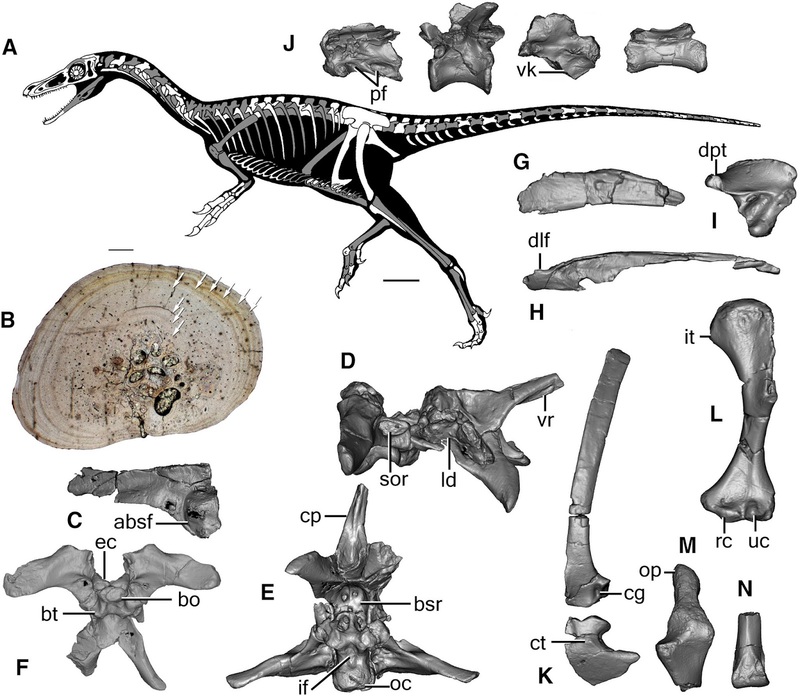 One of the new alvarezsaurs, Xiyunykus pengi, was found in the Tugulu Group of northwestern China. The holotype specimen is fairly complete, though it lacks much of the skull, the pelvis, and a complete forelimb. Enough of the forelimb is preserved, however, to show that Xiyunykus had a typical coelurosaurian humerus while also having a well-developed olecranon process on the ulna. 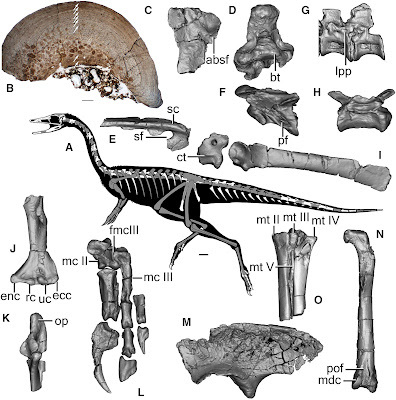 Thus, Xiyunykus exhibits an intermediate forelimb morphology between ancestral coelurosaurs and alvarezsaurids. Skeletal and select elements of Xiyunykus, from Xu et al. (in press). Preserved bones are shown in gray on the skeletal. Restoration of Xiynykus with human for scale, by Tom Parker, under CC BY-SA 4.0. Possibly an even more dramatic intermediate condition is represented by the other new alvarezsaur, Bannykus wulatensis. Bannykus was found in the Bayin-Gobi Formation of northern China and was slightly larger than Xiyunykus. (Both new alvarezsaurs are known from roughly coyote- or rhea-sized subadult specimens, making them larger than most alvarezsaurids.) The holotype of Bannykus is again quite complete, also lacking much of the skull but this time including a nearly complete forelimb. Its arms were shorter relative to its body size than those of Haplocheirus, and its second and third fingers were also reduced. Its olecranon process was further developed still compared to Xiyunykus. However, none of these features reached the extremes seen in alvarezsaurids. If one were to try and infer how the forelimb of an ancestral coelurosaur was evolutionarily transformed into the very unusual alvarezsaurid forelimb, the forelimb anatomy of Bannykus would probably fit the halfway point of that transformation almost perfectly. Indeed, Bannykus translates to "half claw", a reference to its transitional characteristics. Skeletal and select elements of Bannykus, from Xu et al. (in press). Preserved bones are shown in gray on the skeletal. Restoration of Bannykus with human for scale, by Tom Parker, under CC BY-SA 4.0. Interestingly, whereas the second and third fingers of alvarezsaurids were so highly reduced that they likely served no practical purpose, there are hints that the second finger of Bannykus had a specialized function. The joints between the bones of the second finger appear to have been exceptionally flexible. In particular, the claw of the second finger could not only curl toward and extend away from the palm in a wide arc, but may have also been capable of some side-to-side movements and even rotation. Xu et al. suggest that this level of flexibility is consistent with a probing function. Bannykus may have used its second finger to flush out prey from crevices, maybe after it had already broken into their hideout using its robust thumb! 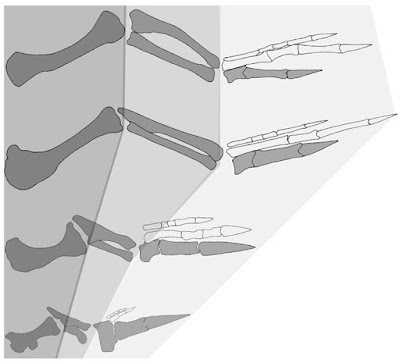 This is not the first time that a probing function has been attributed to dinosaur fingers. A similar foraging method has also been suggested for scansoriopterygids (involving the use of their third finger) and the oviraptorosaur Chirostenotes (involving the use of its second finger). However, both of these previous ideas have been questioned. Being a pennaraptoran, Chirostenotes likely bore large feathers on its second finger, which would have prevented it from using its finger as a probing tool, and the discovery of Yi opens up the possibility that the third finger of scansoriopterygids was mainly used to support a membranous wing structure. Notably, the idea that these dinosaurs probed with their fingers was based primarily on the fact that their fingers were elongate, with no evidence that they were unusually flexible. In any case, regardless of how well the probing hypothesis for Bannykus holds up in the future, the contrast with the vestigial second finger of alvarezsaurids is a good illustration that organisms that we consider morphologically transitional in hindsight can simultaneously have their own unique specializations, and are not simply "waiting around to evolve into something else". From top to bottom: the forelimbs of Guanlong (a tyrannosauroid, representing the ancestral coelurosaur condition), Haplocheirus (a Late Jurassic alvarezsaur), Bannykus (an Early Cretaceous alvarezsaur), and Shuvuuia (an alvarezsaurid), from Xu et al. (in press). All are scaled relative to respective femur length. Note the successive decrease in relative arm length, increase in prominence of projections on the humerus and ulna, increase in robusticity of the thumb, and reduction of the other fingers. In addition to their unusual forelimbs, alvarezsaurids (especially the subgroup known as parvicursorines) also had quite specialized hindlimbs, with very long feet and short toes (likely adaptations for running). The hindlimbs of both Xiyunykus and Bannykus possessed some similarities to those of alvarezsaurids, but were otherwise fairly typical of coelurosaurs. Evidently, alvarezsaurs started doing whatever it is they were doing with their forelimbs before they were selected for specialized locomotion. The phylogenetic analysis in Xu et al. 's study has some surprises. 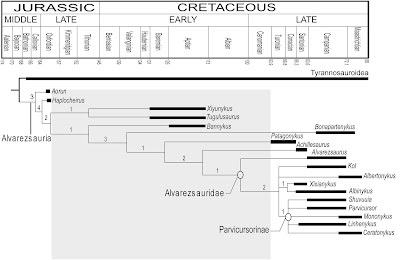 As expected, Haplocheirus, Xiyunykus, and Bannykus are found to be successively more closely related to alvarezsaurids. What is more curious is that Aorun and Tugulusaurus, previously considered basal coelurosaurs or basal maniraptoromorphs, are also found to be alvarezsaurs! Aorun (known from a partial juvenile specimen from the Shishugou Formation) is recovered as the oldest and basalmost known alvarezsaur, whereas Tugulusaurus (known from a fragmentary skeleton from the Tugulu Group) is recovered as a close relative of Xiyunykus. As has been a recurring element of our knowledge about alvarezsaur evolution, the thumb might tell the tale: the most obvious features that Aorun and Tugulusaurus shared with more definite alvarezsaurs are features of the thumb. It would be interesting to see if these results are supported by future studies. 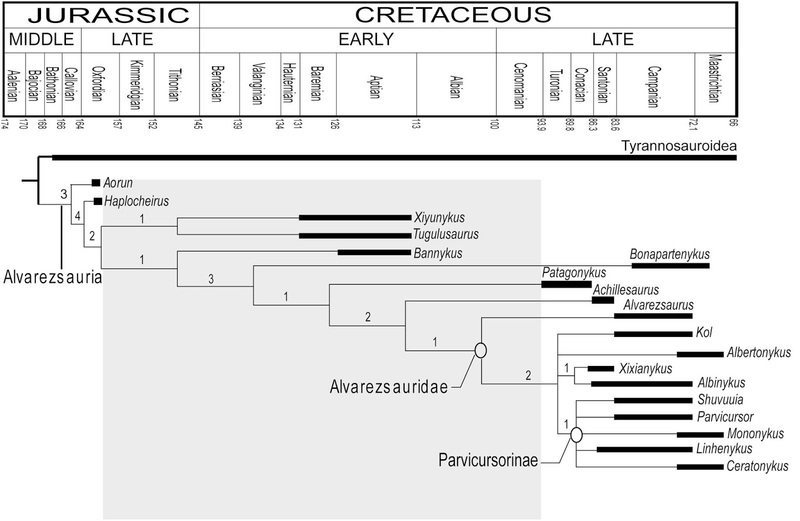 The phylogeny of alvarezsaurs recovered by Xu et al. (in press), from their study. With these new discoveries, alvarezsaurs have gone from being one of the most enigmatic groups of maniraptors to one of the most completely understood in terms of their evolutionary history. That six-year gap between now and the description of Alnashetri has been worth the wait. The forelimbs of Bannykus and Xiyunykus actually look useful. But then the forelimbs get absurdly smaller in more derived alvarezsaurs - if they were used to break into insect nests or wood, the alvarezsaur would have to be shoved up against the log/nest surface, just for the forelimbs to be effective. (With such close contact, the insects would presumably be crawling over the alvarezsaur's belly.) So specialization preceded shrinking in the evolution of the forelimbs, but it's not clear (to me) why the forelimbs became so small (relative to the rest of the animal). I've wondered if alvarezsaurs were carrion eaters, and used their forelimbs to rip into carcasses. The long jaws could then be used to access the rotting flesh and viscera within. Interesting also that the analysis in this paper failed to recover a monophyletic Patagonykinae (Patagonykus + Bonapartenykus). Xu et al. make a similar point (that alvarezsaurids may have used their forelimbs in a distinct manner from Bannykus and Xiyunykus). Personally, I buy the insect-eating model for alvarezsaurids. The reduction in limb length could be a means of increasing mechanical advantage without requiring a dramatic increase in muscle mass. I'm not so sure proximity to defending insects would have been a huge issue; it's not as though longer-limbed myrmecophages avoid being bitten and stung. In most cases, thickened skin and/or dense pelage appear to be enough to protect from the insects, at least long enough for myrmecophages to get a worthwhile meal, and alvarezsaurids could well have had such adaptations. I suspect that the reason we don't see such reduced forelimbs in myrmecophagous mammals today is that they also need to use their forelimbs in locomotion and/or making burrows, which puts a limit on how short the limbs can get. But I'm certainly open to other possibilities for alvarezsaurid lifestyles. Scavenging is an interesting idea, though the cranial material that we have from alvarezsaurids seems more consistent with insectivory than carrion-eating to me. The mechanical advantage hypothesis explains the relatively short and robust ulna (relative to the size of the entire forelimb). But for me, it doesn't explain the tiny size of the forelimbs relative to the entire animal. And, for many parvicursorines, the tiny size of the forelimbs in absolute terms. For little Shuvuuia, the forelimb was ~4cm long. Tiny! What use were they? Well, the humerus would have benefited from increased mechanical advantage as well. Reduction in total length of the forelimb is a logical consequence of shortening both the humerus and ulna. I agree that the small absolute size of the forelimbs is baffling, but I don't think that would have prevented them from use in excavation. If a piculet woodpecker with a total body length of only 8 cm has enough muscle mass to bore into a tree, then I don't doubt that even a parvicursorine could have at least potentially done the same (albeit with the forelimbs instead of the head, of course). Yep, I take your point. Even though Shuvuuia would have had a thumb-claw only ~1 cm long, that doesn't mean it wasn't useful. Like piculets, Shuvuuia could have excavated decaying wood for insect prey (especially larvae). Silky anteaters (Cyclopes) are also very small (Senter 2005 mentions them specifically). Maybe the (weakly) carinate sternum also partly compensated for the small size of the forelimbs in derived alvarezsaurids (parvicursorines)? But, as you say, the biped would have been pressed up against the wood in order for the limbs to be effective. Cyclopes came to mind as well. Though its forelimbs are not quite as small relative to its body, the anatomy of the manus certainly strikes me as being alvarezsaurid-like. And I concur that the keeled sternum in parvicursorines may have helped. There is more material of Alnashetri than that published. As far as I know, a description is in progress. Hence my use of the winky face. This was a great summary! Alvarezsaurs are among my favorite theropods--it's interesting that Bannykus' second finger may have had its own unique specializations apart from the giant thumb. One would assume the group's whole identity is tied to reduction in digits II & III so it's nice to see they may have gotten SOME use out of those fingers (at least in Bannykus' case). I was aware of an SVP 2016 abstract whereby Tugulusaurus is mentioned as alvarezsaurian, and the recovery of Tugulusaurus as an alvarezsaur by Xu et al. (2018) along with the discovery of Bannykus and Xiyunykus helps to illuminate the post-Jurassic, pre-Cenomanian evolutionary history of alvarezsaurs. Yes, that was in fact the abstract that ended up becoming the description of Bannykus and Xiyunykus. I was at that talk and have been waiting for this publication ever since! I once had an hypothesis for the evolution of the alvarezsaur forelimb, under which specialization of the forelimb came *after* reduction. In other words, the forelimbs were first shrunk down, then they became functionally monodactyl & highly specialized. Thanks to these new alvarezsaurs, my hypothesis has now been refuted. That's good - the point of a hypothesis is to be tested. But now I wonder WHY the forelimbs became SO small after becoming specialized. Even allowing for mechanical advantage, the forelimbs still seem absurdly small. Is it that the forelimbs weren't used that often (e.g. used to break into rotting wood to get to insects), so they were reduced to the minimum possible size for them to remain functional? It's a fair question, Tim, and I can't say that I have a satisfactory answer to that. Speculating idly, I wonder if it was to assist with streamlining the body, especially when the stiffening of the forelimb joints prevented the forelimbs from being folded up instead. Yes, I wondered the same thing. The highly reduced forelimbs helped increase agility during running (reduced rotational inertia etc). In lieu of the ability to compactly fold the forelimbs against the body, the alternative was to reduce the overall size of the forelimbs. There does appear to be an increased emphasis on cursorial adaptations, with derived alvarezsaurs being highly cursorial. Might be a positive correlation with forelimb reduction? Certainly seems plausible to me.